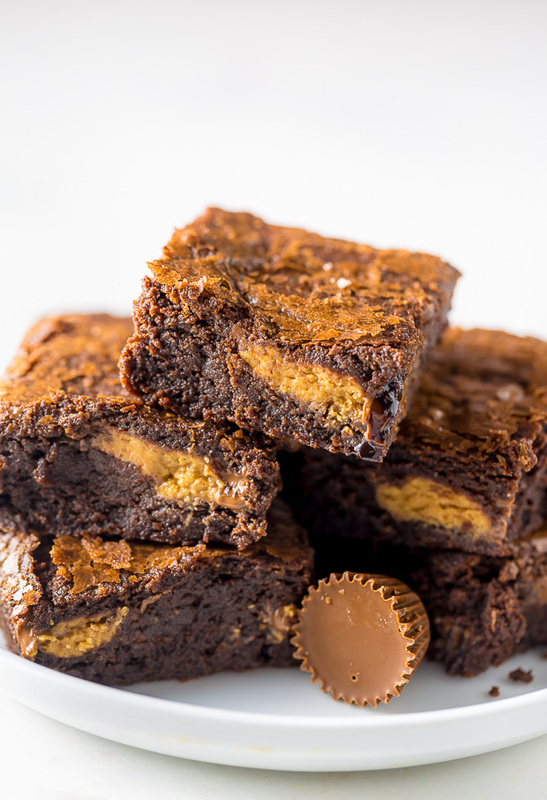 Rich and FUDGY Peanut Butter Cup Brownies! 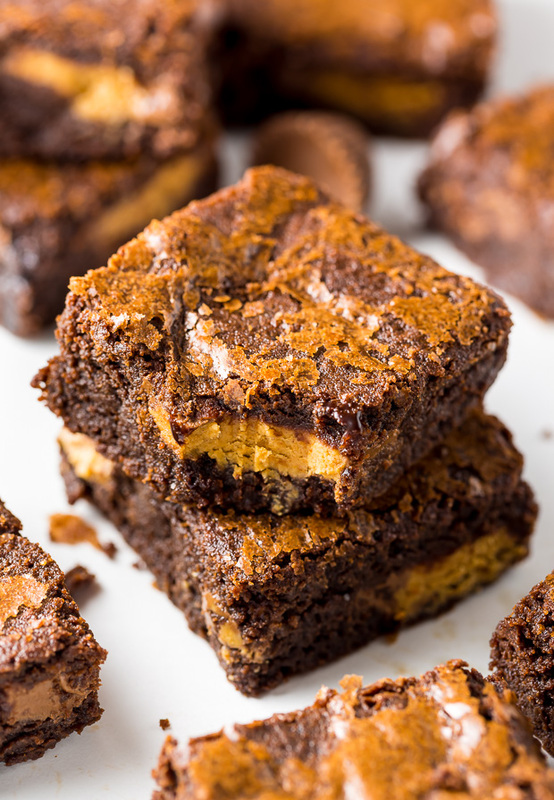 If you love chocolate and peanut butter, you have to try these easy peanut butter cup brownies! I’ve been having quite the affair with brownies lately! 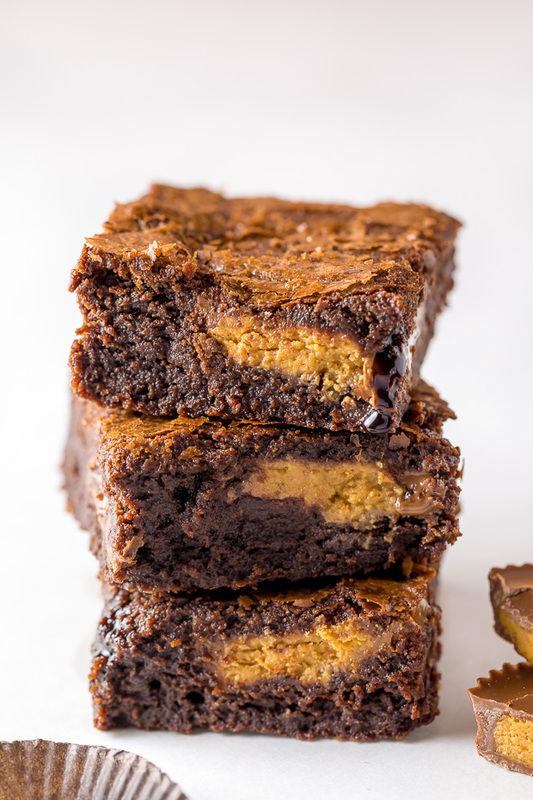 And based on your reactions to recent recipes like these brown butter walnut brownies and these espresso chocolate chunk brownies, you guys really love them too! 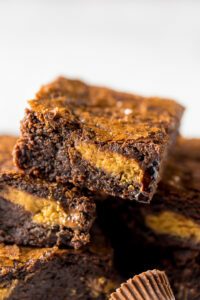 Since we’re both loving them so much right now, I figured today was the perfect time to share these PB Cup Brownies. Although the base of this recipe is really simple, the results are mind blowing! You could certainly pass these off as “bakery bought” brownies. These brownies are super rich, fudgy, and just a little chewy. Mainly at the edges! They’re also packed with over a dozen FULL SIZE peanut butter cups and a whole cup of peanut butter chips. Because I wanted to enhance the peanut butter flavor without actually adding peanut butter to the batter, I used brown butter in this recipe. It worked like a charm! If you’ve never browned butter before, don’t fret! It’s very easy. You’ll need a saute pan, butter, and a touch of patience – that’s it! You’ll start off melting the butter; once the butter has completely melted, you’ll continue to cook the butter, on medium heat (or medium-low if your stove top runs hot), until it’s turned a golden brown and smells slightly nutty. Just be sure you stay stove side once the butter has melted; brown butter can turn into burnt butter very fast. The brown butter adds a slightly nutty flavor you’re sure to love! Since there’s 12 ounces of chocolate in this recipe, I highly recommend using quality chocolate you know melts well and tastes good. The flavor definitely shines through! You know I love Lindt 70% cocoa bars and they’re my go-to for this recipe! And no – I’m not an ambassador for Lindt. At least not yet 😉 I just really love their chocolate! Whatever brand you choose, just be sure you’re using real chocolate bars, and not chocolate chips. I love chocolate chips – just not for this recipe! They don’t melt well and are inferior in taste. You will need peanut butter chips for this recipe. You can find them in the baking aisle, or buy them here. Don’t worry if the peanut butter chips melt into the batter when you mix them in! They’re added more for taste than texture. You’ll add the batter into the pan first, then press the peanut butter cups into the batter. You’ll want to use a spatula to scrape batter back over the peanut butter cups so they’re completely covered. It’s OK if you can see the shape of the peanut butter cup, as long as it’s totally covered. Be sure you don’t over bake your brownies! They should not be liquid when you pull them out of the oven, but don’t be afraid if they have a little jiggle in the middle. The brownies will firm up as they cool. Over baked brownies will not be fudgy. 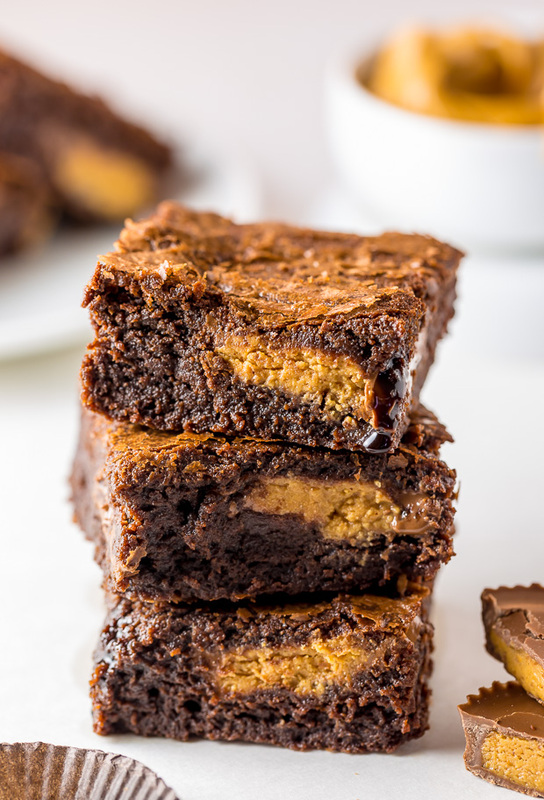 Thick and fudgy Peanut Butter Cup Stuffed Brownies! Preheat the oven to 350 degrees (F). Line a 9×13 inch baking pan with parchment paper; spray paper and any exposed pan with non-stick baking spray and set aside. In a medium bowl, combine the flour, cocoa powder, and salt; whisk well and set aside. Place chopped chocolate in a large bowl and set aside. Melt butter in a medium-sized skillet over medium heat. Continue cooking butter, stirring frequently, until it's a light amber color and smells slightly nutty. Remove from heat at once and pour over the chopped chocolate. Let the chocolate/butter mixture sit for 2 minutes, then whisk smooth. Add both sugars and vanilla and whisk smooth. Add 3 of eggs to the chocolate mixture and whisk until combined. Add the remaining eggs and whisk until combined. Do not overbeat the batter at this stage or your brownies will be cakey. Sprinkle the flour/cocoa powder mixture over the chocolate mixture. Using a rubber spatula (not a whisk), fold the flour mixture into the chocolate until just a bit of the flour mixture is visible. Fold in the peanut butter chips. Don't worry if they melt into the batter! Pour the batter into the prepared pan and smooth the top. Press the peanut butter cups into the batter, making 5 rows with 3 peanut butter cups in each row. Use a spatula to cover each peanut butter cup with brownie batter. You don't want any of the peanut butter cups showing. Bake in the center of the oven for 30 to 34 minutes, rotating the pan halfway through the baking time, or until a toothpick inserted into the center of the brownies comes out with a few moist crumbs sticking to it. Let the brownies cool completely in the pan (this will take about an hour to an hour and a half), then lift them out of the pan using the parchment paper. Cut into squares and serve. *To speed up the cooling process, you can pop the tray in the fridge. 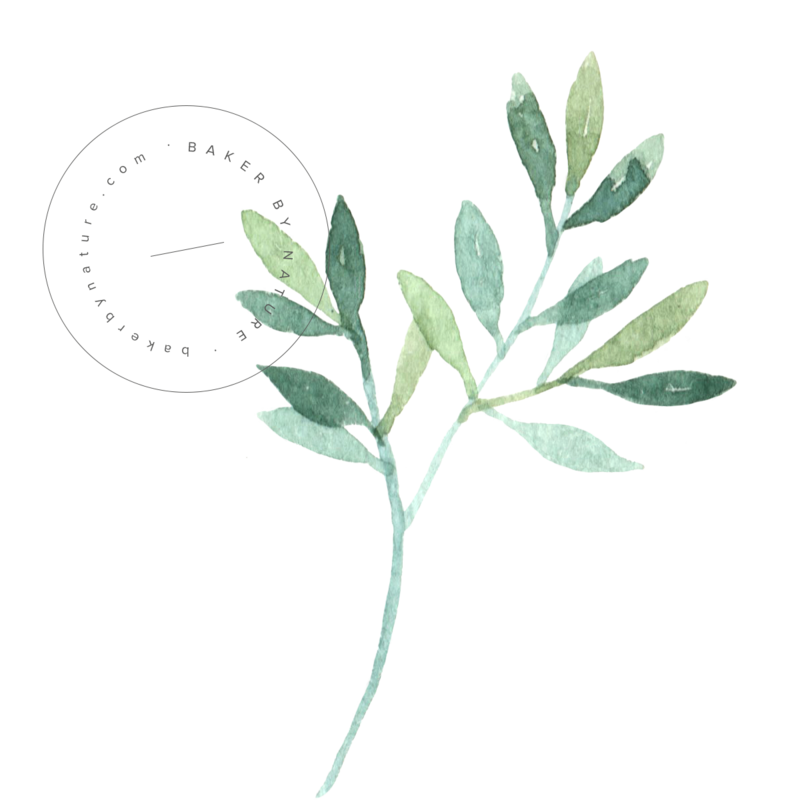 Store at room temperature, in an airtight container or wrapped tightly with plastic wrap, for up to 3 days. Total time does not include cooling, which will take at least an hour. 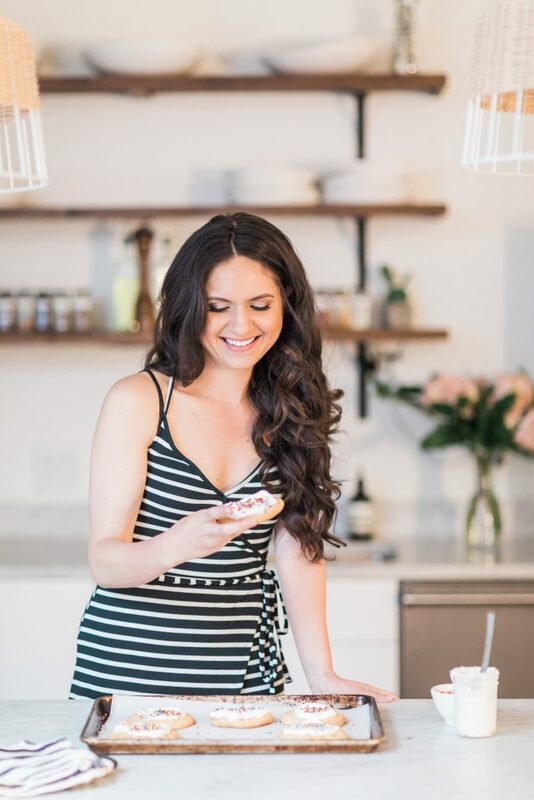 For tips and tricks on recipe success, please see post! oh GOD these brownies are INSANE. I love how fudgy they look and the pb just makes them even better! !